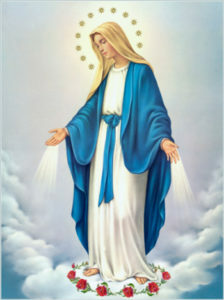 We, the women of the Blessed Virgin Mary Sodality of St. Polycarp Church, give praise and honor to our Mother Mary by promoting her devotions, praying the Rosary, providing children with Rosary Books, Rosaries, Miraculous Medals, and distributing Rosaries to Missions around the world. We encourage this most powerful form of prayer that leads us closer to Christ. All ladies are invited to join us. Meetings are monthly, on the first Monday of the month, from September through June. Join us at 11:30 a.m. for the Rosary followed by a brown bag lunch & business meeting. The Sodality is a religious body of women which aims at fostering in its members an ardent devotion, reverence, and filial love towards our Blessed Mother. Through this devotion, it seeks to gather its members together, under Her name, as good Catholics striving to sanctify themselves and their neighbors and to defend the Church of Christ. In true spirit of the Sodality, members should receive the Eucharist frequently (and at least once a month as a group), practice devotion to Mary daily through the rosary, novena, etc., and attend Mass and receive the Eucharist on feast days of the Blessed Virgin. It is recommended that they devote some day(s) every year to spiritual exercise of a Retreat or Day of Recollection.